Best-ever recipe for soft sugar cookies you can roll and cut out with cookie cutters! Easy to make, no chilling required, and they don’t spread into shapeless blobs as they bake. Made with a secret ingredient that gives them the most incredible flavor, and topped with a cool sour cream icing. 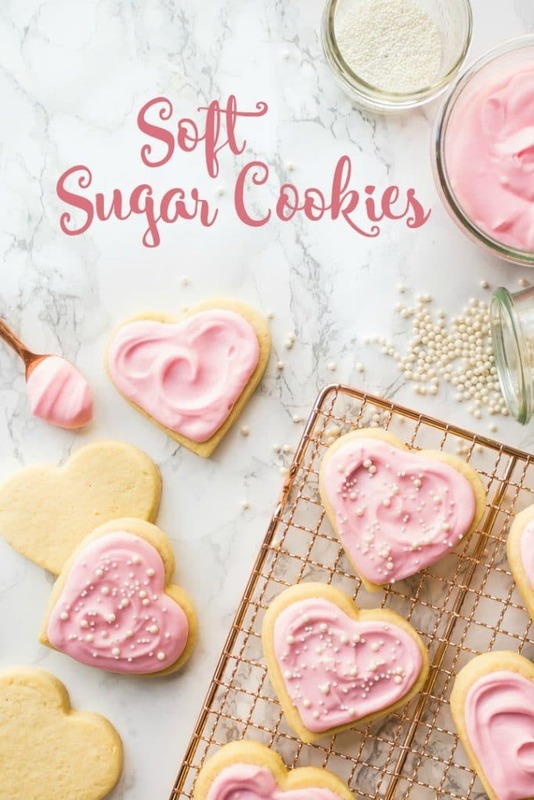 I already have 2 sugar cookie recipes on this site: one is for Cut-Out Cookies that Don’t Spread, and the other is for Soft & Chewy Sugar Cookies. I love them both for different reasons. 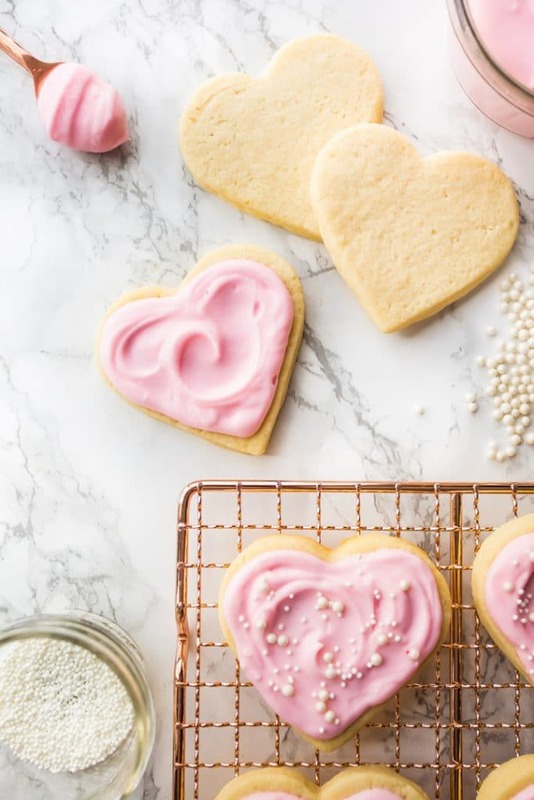 The cutout cookies that don’t spread are perfect for cookie decorating, and by that I mean the kind of decorating that is almost like a work of art. If you are a cookie artist, this is the recipe for you! They are easy to make and sturdy as can be (perfect for shipping), and they hold their shape beautifully. The texture is similar to shortbread, but not crumbly. The soft and chewy sugar cookies are a drop cookie, so there’s no decoration needed! If you want you can jazz them up with some colorful sprinkles, or sparkling sugar, but they don’t really need anything more. They’re easy-peasy and quick to make, perfect for when a sugar cookie craving suddenly hits! But these soft cut-out sugar cookies are in a category all their own. It’s the best of all possible worlds, a sugar cookie that is soft as can be, rich, and tender, that you can roll out and cut shapes from! The shapes hold up really well too. Say goodbye to those indistinguishable blobs that you’ve pulled from your oven in the past. These sugar cookies keep their neat edges. I did my research on this problem back in 2011 when I published that first cut-out cookie recipe. You can read about all the reasons why these rolled cookies don’t spread by clicking this link: How to Bake (Easy! and Delicious!) Cutout Cookies with Neat Edges. I used all those same tricks when I created this new, soft, rolled sugar cookie recipe. And all the tricks to make rolling and cutting sugar cookies quicker and easier. You don’t have to chill this dough, and you don’t even have to put flour on your counter! This recipe is no-muss, no-fuss, quick, easy, and incredibly delicious! The flavor is like none other, thanks to a secret ingredient: cream cheese! The cream cheese imparts the most incredible richness. The cookies almost taste like cheesecake! And all that creamy-dreaminess is reinforced when you top these sugar cookies with a cool sour cream icing. I discovered this frosting back in December, when I made those Chocolate Peppermint Swig Cookies, and oh my goodness! It is so good. It’s sweet and creamy and adds so much to this recipe. Just spread it on with a spoon and garnish with a few festive sprinkles. So pretty! If you love your sugar cookies soft, be extra-careful not to overbake them! Your bake time could vary based on how thick you roll the dough, and what size cookie cutters you use. If the dough is rolled thinner than noted, and the cutters are small, you probably won’t need the full bake time listed on this recipe card. Use your judgement, and pull them from the oven when the edges feel set and the cookies are just barely beginning to turn golden on the bottoms. If you bake them too long, they could become hard. You can decorate these cookies with royal icing too! I made a big batch to donate to my kids’ school, and they came out fantastic. The sour cream frosting is just a little quicker/easier, and it tastes so good! If you want, you can skip the sugar cookie icing, and just use sprinkles instead. Top the cut-out shapes with sprinkles before they go into the oven. These sugar cookies can be baked several weeks ahead and frozen. Just stack them up in a zip-top bag and pop them in the freezer. When you’re ready to serve, let them thaw at room temperature (with the bag open), and frost them with icing. If you prefer to chill the dough, you totally can. (Refrigerate for 2 hours or overnight.) I’ve tried it both ways: with and without chilling, and both work beautifully. If you chill the dough, it’s a little harder to roll out, but the shapes cut very nicely. I prefer not to chill because I am impatient. It still works well, but I do think it’s helpful to dip your cookie cutter in flour before every cut. If you’d like to make a gluten-free sugar cookie, just sub out the all-purpose flour for a gluten-free flour blend. I link to some of my favorites in this post: Why Use Cake Flour? For a dairy-free sugar cookie recipe, use cold (solid) coconut oil in place of the butter, and use vegan cream cheese. These soft sugar cookies will keep at room temperature for 1 day, or in the fridge for about a week. The sugar cookie frosting will form a slight crust on the top after about an hour, but it will remain soft and moist underneath, so be careful about stacking them! 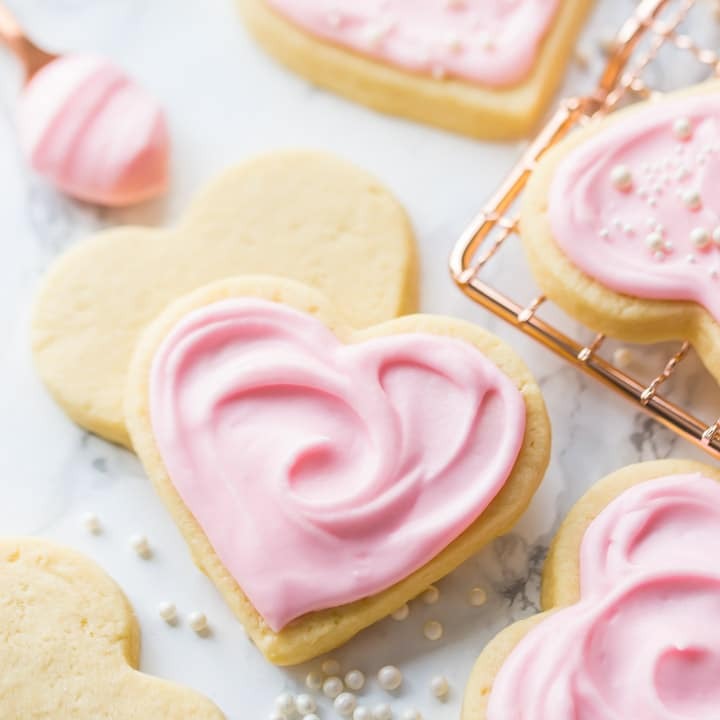 For tips on how to decorate with royal icing, check out these posts: Iced Chocolate Peppermint Cookies, and Spiderweb Cookies. Find tons more great cookie recipes on my “Cookie Recipes Galore” Pinterest board! Best-ever recipe for soft sugar cookies you can roll and cut out with cookie cutters! Easy to make, no chilling required, and they don't spread into shapeless blobs as they bake. Made with a secret ingredient that gives them the most incredible flavor, and topped with a cool sour cream icing. Preheat the oven to 375 degrees F and line baking sheets with parchment paper. Place the butter, cream cheese, and sugar in a large mixing bowl and beat on medium-low speed until smooth (about 1 minute). Add the egg yolk, vanilla, and almond extract and mix on medium speed until combined. Scrape the bottom and sides of the bowl with a silicone spatula, then add the flour, cornstarch, and salt. Mix on medium-low speed until a stiff dough forms (about 1 minute). Roll the dough to 1/4-inch thick (rolling pin rings ensure an even and exact thickness) between 2 sheets of parchment paper. Remove the top sheet of parchment, and cut shapes with a 3-inch heart cookie cutter. Peel the shapes from the bottom layer of parchment, and place on the prepared baking sheets. Bake for 12 to 16 minutes, or until just barely beginning to turn golden on the bottoms. Cool completely, then frost with sour cream icing. Place the butter, sour cream, powdered sugar, and salt in a large mixing bowl and whip on medium speed until smooth. Tint with pink food coloring, and garnish with white nonpareil sprinkles and white sugar pearls. Considering your regular sugar cookie recipe is THE BEST EVER I assume these are too!!! Is the short shelf-life (1 day at room temp) because of the sour cream icing? If I used something like royal icing would they last longer at room temp? Thanks! 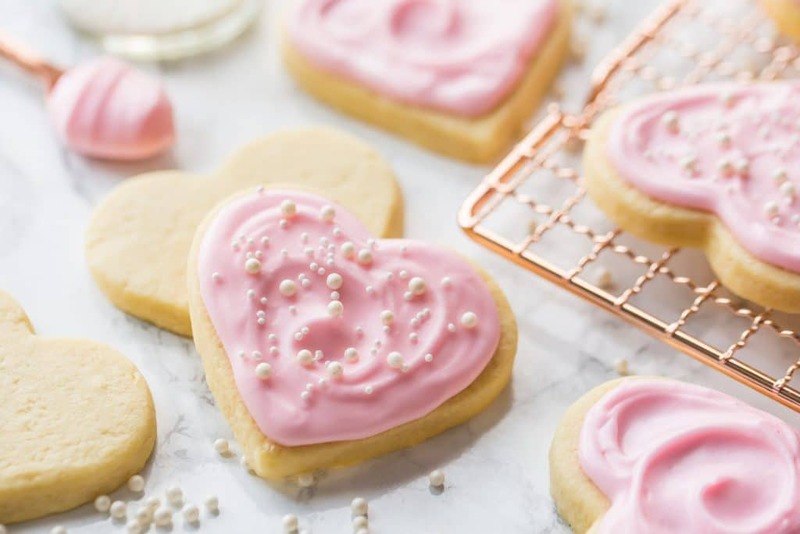 These sugar cookies would be a great treat for mom on Mother’s Day! Is the short shelf life (1 day at room temp) because of the sour cream icing? If I used something like royal icing, would they be ok for longer at room temperature? Thanks! Yes I think they would Sara! And honestly that is a very conservative estimate. I tend to be pretty relaxed with these kinds of things I my own home, and I’ve had them out for more than a day for sure & they’ve been fine. The sugar content is high & that will inhibit the growth of microbes. Mine have sat out as long as 4 days and been just fine. These are simply gorgeous…as always! Allie, Could I sub sour cream for the cream cheese? how much? Hi Jeannie! I’m sorry but I have not tested the recipe with sour cream so I can’t really say for sure. It works beautifully with cream cheese though! They look so good and easy to make!! Picture-perfect! Hey Daniela! This dough is a little softer than my other cut-out sugar cookie recipe. Try reading the bullet-ed tips for success above- you may want to try chilling the dough, especially if it’s particularly warm in your kitchen. Hope that’s helpful! I’m just a home baker that makes cookies every now and then. Being new to all of this making and decorating cookies, I have tried many different sugar cookie recipes the past 4 years trying to find one everyone liked. I thought I had found my perfect go to recipe last year but not anymore. I made and decorated a large batch of this recipe then gave some to 3 of our neighbors and 3 other families to taste test for me. Not one of them had anything bad to say about the cookie or icing. They LOVED the cookies. As a test, I have left my cookies set out uncovered for 4 days now and they’re still soft and taste good. People were surprised they sat out that long and hadn’t become bricks. I also found a glaze icing recipe that everyone likes. It now replaces my royal icing which many didn’t care for no matter how I tried flavoring it or trying to make it softer. I now have the perfect combination for a great sugar cookie that everyone loves. I’m so happy to hear this Tammy! I love this recipe too- the taste and the fact that it truly stays soft. Thanks so much for the positive feedback! I have not tried the recipe yet it sounds perfect, but I would have liked it better if you would have included the amount of cookies the recipe yields. Hey Carolyn! I don’t include that because it can vary so much based on the cookie cutters you use. They come in all different sizes and there is really no standard! I love the almond extract in this, it gives it an addicting flavor. I’ve made this a couple times now, and I’ve found it works best if I soften the butter beforehand- otherwise I end up with butter pockets in the final cookies, which melt in the oven and create air pockets, giving the cookies an uneven surface. I’m also someone who never has butter softened ahead of time, so I pour boiling water in a glass bowl or drinking glass, empty it, and turn it upside down over my sticks of butter. In about 5 minutes it’s soft enough to cream with sugar. I also found that splitting my dough in two and chilling it for 10 minutes made it so much easier to handle, and when I cut out my cookies they didn’t stretch out or stick to the counter. Love your tips Sarah! Thanks so much for sharing! Can we store the dough if we dont use all of it at once? If so for how long?? You can, but it might become a little dried out as it sits. If you don’t plan on rolling and cutting your cookies right away, it’s a good idea to use a little less flour. Hi Susan! I’m so happy you like it, but I should let you know that’s it’s a soft cookie and not really shortbread-like. If you’re looking for more of a tender-crisp, shortbread-like cookie, you should check out this post: https://bakingamoment.com/cutout-cookies-neat-edges/. Hope that is helpful to you! Hi there! I’m wondering if the cream cheese should be soft and at room temperature for this recipe? Hi Rose! Thanks for the great question. I understand your hesitation and you are right- it will take longer to blend together this way. And you want to just be extra careful, making sure there aren’t any lumps of butter or cream cheese. If you really don’t want to do it this way, you could always chill your dough after it’s made, and bring the temp back down that way. Using cold butter and cream cheese is meant to eliminate that step. But if you do that, just know that the dough becomes drier as it sits, so it would probably be a good idea to cut back on the flour a bit, so it doesn’t become too crumbly and so it spreads properly. It’s a delicate balance! I like this method because it’s quick and easy, and it’s proven to work well for me in the past. I make this recipe a few times a year and the results have always been great for me. But if it doesn’t feel right for you that’s totally fine! Hi, can this sour cream frosting be used to pipe on the cookies? I want to use this recipe for decorating Christmas cookies and would rather use this frosting instead of royal icing because it stays soft. Thank you! It might be a little too thin for piping. You could either add more powdered sugar, to make it stiffer, or try this buttercream instead: https://bakingamoment.com/easter-basket-cupcakes-with-american-style-buttercream/. Good luck! Followed the recipe to the letter. Dough was much too stiff and crumbly to work with effectively. Eventually was able to roll the dough and cut the cookies. Put them in at 375 and checked on them half way. They were burnt. Lowered temp to 350 and halved the time. Still much too dark. Not sure why I had so much trouble with this recipe (it it because I’m at sea level?) but I likely won’t try again. Too bad; I love cream cheese in baked goods. Hey Tuesday! I’m so sorry you had difficulty. I’m not sure what could have caused this for you- I’ve made this recipe a number of times and have never experienced what you are describing. And I gave all the other reader comments a skim and it doesn’t seem like anyone else has had this result either. If anything the dough is sometimes a little too soft. Also, for cookies to burn in just 6 minutes is definitely a red flag. I think there is definitely something wrong there. Hi I made these and for some reason the dough didn’t stiffen after I added the flour and cornstarch. So I ended up adding 1 1/4 cup extra flour until it got stiff enough to not stick to my fingers. Did I do something wrong? I used cold butter and cream cheese and cold egg yolk. The cookies worked out but they ended up being a bit chalky. Was it due to the addition of extra flour? Thank you for your help! Hey Noelle! So sorry you had trouble. I think if they tasted chalky it may have been because of the additional flour. Maybe next time try adding not quite so much? And if you let the dough sit for an hour or so, it should stiffen up a bit and become less sticky. You shouldn’t have to do this every time, perhaps only on very humid days. 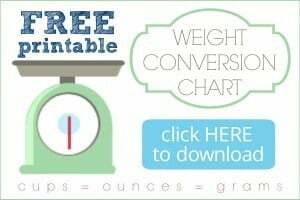 I hope this is helpful! I absolutely stink at rolled out dough cookies and I pulled these off. WOOHOO. It is a pretty soft dough so once I got the hang of rolling it, I worked fast but I guess one could chill it. I liked rolling in between parchment paper- I have never done that before. It worked great and clean up was a breeze. They were awesome and I am making more for my son’s Christmas party. They are THAT good. I did the sour cream icing and let them “sit” though they were gone in two days. No issues, just happy bellies. That’s so great to hear! Thank you so much for the positive feedback. I hope everyone at your son’s party enjoys! Merry Christmas! Love this recipe. I’m always afraid of cut out cookies especially with the kiddos, but these were so easy it made it tons of fun & they barely needed my help with rolling & cutting. Thank you! Perfect! I made numbers shape for my son.. I can’t believe how easy the dough was to work with and the way it retained the shape. I live in hot humid country so I refrigerated the dough after cutting them out for about 15minutes. Thank you. My pleasure Mina! I hope you and your son enjoyed! Made these last week and they turned out AMAZING! I want to make them for a party next week but wanted to try a small cookie, maybe 2 bite size or so. What would you guess the cooking time would be for a small cookie and would I want to lower the oven temp as well? EXACTLY what I was looking for when I googled “soft roll and cut sugar cookie”. The cookie texture is exquisite, and the frosting is perfect–just enough of a crust formed to be able to pack and transport, but still soft. Took them to coffee hour at church last Sunday, and people were STILL talking about them this Sunday! Making them again today in the shape of stars for an Oscar party. That’s so great to hear! I’m so happy you and your friends were pleased. Thanks so much for the awesome feedback!